Emad is a Syrian developer who has published many open-source code to support Syrians. 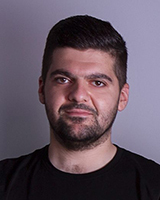 Emad has 5 years experience of developing eCommerce solutions and integrations, which made him the best co-founder to lead the development process at the biggest marketplace for refugees in the world, Sharqi Shop. Emad is expert in security, payment gateway and shipping integration for eCommerce solutions. Programming is similar to handicraft industry, both of them require patience, accuracy, and focus to deliver high quality products. I’ve enjoyed developing eCommerce solutions to help Syrian artisans to reach international market."